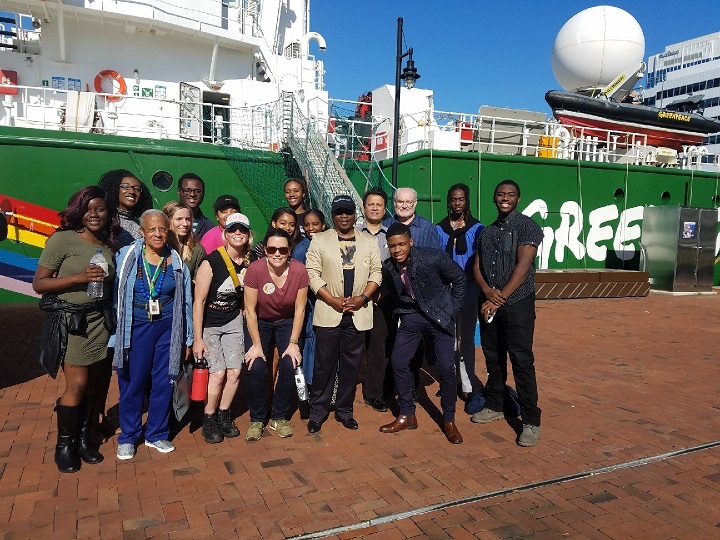 On Friday, Oct. 20, crew members from the Greenpeace Ship Arctic Sunrise gave a group of Norfolk State University students and faculty a private tour of the ship explaining their mission and their goals. On Friday, Oct. 20, crew members from the Greenpeace Ship Arctic Sunrise gave a group of Norfolk State University students and faculty a private tour of the ship explaining their mission and their goals, as well as showing what everyday life is like on the Arctic Sunrise. Greenpeace ships travel the world peacefully protesting issues, which range from offshore drilling and seismic blasting to rainforest conservation. The crew consists of many different nationalities and they are a nonprofit, independent organization supporting environmental concerns. “For them to live in such a small space for three months at a time and still be dedicated to their work everyday is incredible and impressive,” said Monique Gatling, political science major. This specific ship is an ice class ship meaning that it is capable of going through ice covered waters by rising above the ice and then crashing down on it to break it. There is a fully stocked hospital on the ship. “A couple of things stood out to me about the tour like how everything was tied down on the boat from the boat rafts to the crewman’s shoes,” said Ronesia Spicer, health service management major. The Arctic Sunrise is taking a tour down the east coast to bring awareness to the coastal communities and the issues they need to focus on. While docked in Norfolk over the weekend, their goal is to bring awareness to offshore drilling and seismic blasting. With the laws changing, they want to inform the coast of what impact these actions have on the marine environment and let them know what they should do to help stop these actions from continuing. Seismic blasting is the technique that oil companies use to find oil in the sea floor. They send loud blasts of air to the sea floor and use the readings to see if there is oil present. This blasting happens every 10-20 seconds and can continue for months. These blasts interfere with the marine life, especially those who rely on echolocation to find food. For many students, this information opened their eyes further to the issues that are surrounding the globe, as well as issues that are closer to home. Visit www.greenpeace.org for more information on the Greenpeace mission. Tags: Arctic Sunrise, boat, dock, East Coast, ecosystem, Environment, environmental, Greenpeace, Marine, marine environment, marine life, Norfolk, Norfolk State, NSU, Offshore Drilling, seismic blasting, ship, tour. Bookmark the permalink.